A set of miniatures to replace the standard tokens for Sentinel Tactics: Uprising. 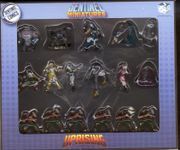 It comes with miniatures of all playable characters from Uprising including 6 copies of Proletariat, as well as Unity's mechanical golems. They come painted or unpainted.